The Beatles’ 1967 hit “Strawberry Fields Forever” has long been considered one of the greatest pop songs ever recorded. Released in February of that year as a double A side single along with Penny Lane, the song peaked at number eight on the US Billboard charts (The Turtles’ “Happy Together” was number one that week). In 2011, Rolling Stone named it the band’s third greatest song and the 76th greatest song ever. Written by John Lennon, it’s a true masterpiece, but what it isn’t is a song about fields full of strawberries. The Beatles were going through a rough patch when they all splintered off in the summer of 1966, immediately following what would be their last US live performance at San Francisco’s Candlestick Park. The Fab Four would eventually reunite for six more albums (and one legendary, unannounced rooftop live performance), but that wasn’t known in the summer of ‘66. For his part, Lennon made his way to Almería, Spain to star in the black comedy How I Won the War. With long waits between shooting scenes, Lennon had plenty of time to write. In six weeks, he had a working version of the song that would come to define the Beatles’ second act. John Lennon’s childhood wasn’t particularly happy. When he was a baby, his banjo-playing father Alf was rarely home and often away at sea as a merchant. Tired of his travels, John’s mother Julia fell in love with another man and got pregnant with John’s half-sister. This caused a tremendous rift in the Lennon family with Julia’s sister Mimi calling social services twice on her own sister for raising John in, what she called, an unfit home. Eventually, social services handed John’s care over to Aunt Mimi and he spent a large portion of his childhood at his Aunt’s suburban Liverpool home in a town called Woolton – the house is now part of UK’s National Trust as a museum. John’s relationships with his parents after that were tragic. He wouldn’t see his father again for over two decades. John’s mother was hit and killed by a speeding car while crossing a road when John was only 17. According to Cynthia Lennon, John’s first wife, while Aunt Mimi did care for John, “she was not a woman for cuddles and praise.” Ruling with an iron fist, John was expected to be obedient, well-behaved and groomed. Later, biographers would write that he had a hard time making friends. It’s little wonder that young John Lennon had a rebellious streak and would often go in secret to play in the gardens of his next door neighbor – the girl’s orphanage Strawberry Field. The history of Strawberry Field dates back to 1870, when the property was owned by a wealthy English ship owner named George Warren. On the site, he built a giant gothic mansion that was in line with England’s Victorian-era, complete with a iron wrought gate, gardens and flowers. In 1927, another wealthy ship magnate named Alexander C. Mitchell purchased the mansion and property. Seven years later, Mitchell’s widow sold it to the Salvation Army. On July 7, 1936, the home was opened as a orphanage for up to forty girls. Two decades later, boys would be allowed in, but throughout most of John’s childhood, Strawberry Field was an all-girls’ orphanage. When John Lennon brought the song back to the band in November of 1966, it was met with awe. Engineer Geoff Emerick recalled to Rolling Stone that fateful moment, “There was a moment of stunned silence, broken by Paul, who in a quiet, respectful tone said simply, ‘That is absolutely brilliant.’” Over about a month, the band tinkered and recorded the song. It is widely thought of as the most complicated recording the Beatles ever did. When it was released in February of 1967, it was exactly what McCartney said when he first heard the song John Lennon named after a Liverpool girl’s orphanage – brilliant. Today, Strawberry Field is in a state of disrepair despite continuing to be a tourist attraction for Beatle fanatics. In 2005, after nearly 70 years as an orphanage, it closed down and all the remaining children were transferred to foster families. 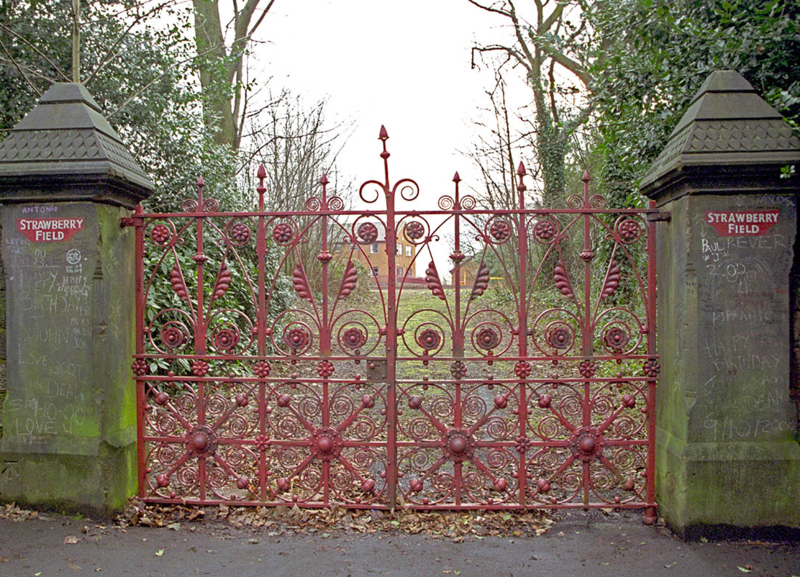 While many of the original buildings and structures were torn down in the 1970s, a few still remained including the iconic red Victorian-era Strawberry Field gates – until 2001. 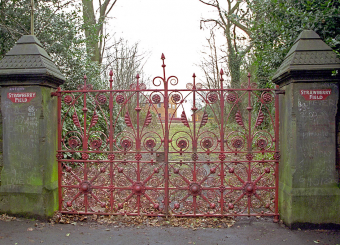 The gates, which dated back to Warren, were put into storage and replaced with replicas, leaving many fans (and tour guides, who rely on Beatle-related income) upset. Plans were announced in 2014 to turn the site into “a training centre for people with learning difficulties” along with a museum and artifacts dedicated to the influence this place had on the Beatles and John Lennon. However, as of this writing, Strawberry Field remains abandoned and mostly decrepit. 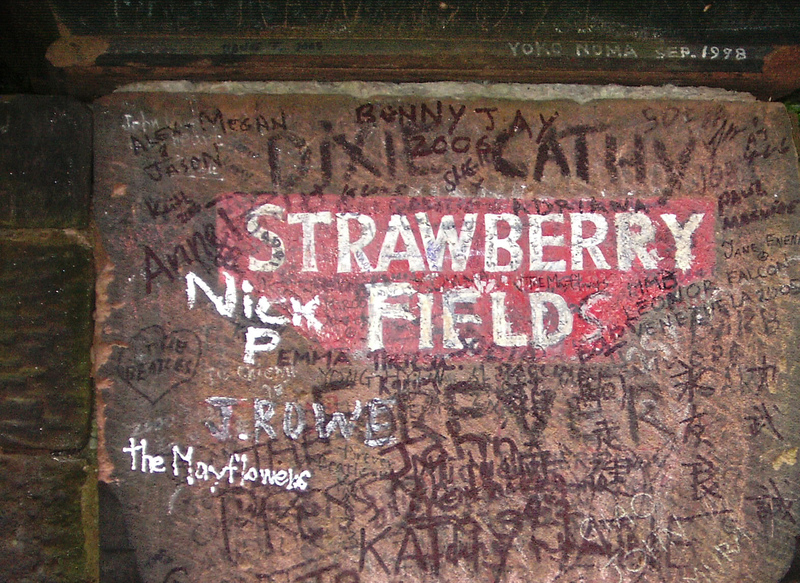 My recollection of “Strawberry Fields” was of a song that involved and reflected a protest (usually supported by a group) against”the powers that be” for singling out for penalty (possibly legal) – or severe criticism, of an innocent individual whose well meant actions , or avoidable errors, comprised a serious and meaningful agenda. Thank you for this great explanation. I had known Strawberry Field was an orphanage, but didn’t realise it’s significance for John.